Will your pup be poolside this summer? Your pet can make a splash this spring and summer in our Wall and Tinton Falls Resorts swim parks and pools. 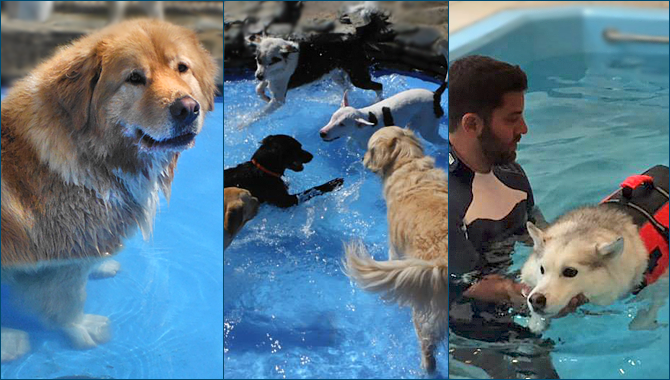 Dogs love to interact, play and just beat the heat in our luxurious aquatic environments. Does your dog enjoy a refreshing swim from time to time? Purr’n Pooch features dog swimming pools with gorgeous natural rock landscaping and waterfalls—perfect for a recreational swim your dog will love. A swim in our dog pool is great for all ages and provides your dog with a fun experience. Let us schedule a session for your pooch to experience our dog swimming pools. This unique service is offered at our dog kennels, and can be added to any doggie daycare and boarding package. Our swim parks are chemical free and emptied and filled daily. Purr’n Pooch offers aquatic exercise sessions in our indoor spa pool located in Wall, NJ. Our experienced pet care technicians will care and comfort your dog with ease and patience. Swimming, games, and other exercise routines are part of the fun as your friend learns to move and play gently in our warm, spa waters. Private sessions are available and the pool setting is calm and quiet – ideal for relaxation and rejuvenation. Watch our friend Kyle Ann enjoying her aquatic exercise with Purr’n Pooch’s pet care technician here.